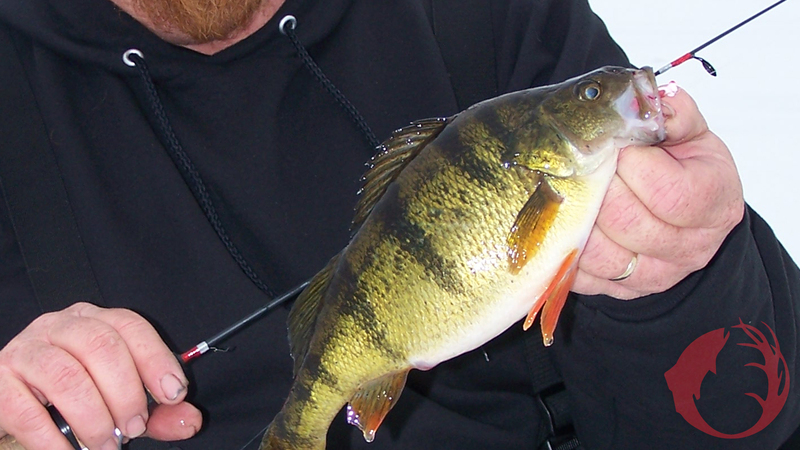 It was a clear, cold mid-winter day and the perch wanted tiny baits moved slowly, and that’s what Brian Brosdahl gave them. I went ice-fishing for the first time of the season a few days ago. It was a good trip even though the fish chose not to participate as much as we would have liked. We were on a lake in central Minnesota: The ice was about 15 inches thick. Anglers had been driving on it for several days. The walleye bite had been good, but a weather front was going through and had slowed the bite noticeably. Even under the ice, fish feel the effects of weather systems. It was windy, and air temps were dropping: It was about 0 degrees. Combined with serious wind, that made it cold. Fortunately for today’s ice-angler, cold weather is no excuse to not go fishing. The clothing and equipment available to us today is outstanding. Even in very cold conditions, we can still get on the ice comfortably. First the technique. Our group of 3 anglers headquartered out of one of the new CORE ICE shelters. These are lightweight but very sturdy shelters on wheels. Their design allows them to be customized to any anglers needs, and they’re warm. We were able to fish very comfortably inside while we heard the wind howling outside. Each angler had a sonar unit and 2 holes to fish. Oftentimes while fishing that close to each other, interference from 1 sonar to the others would make it hard to read your sonar, but the Vexilar sonar units that we used enabled us to make the necessary adjustments so that we could all see everything that was going on below us, although much of the time we didn’t like what we saw. The weather really had the fish shut off: They just didn’t want to eat. They would come in and look at our jigging spoons, but wouldn’t eat them. To combat this dis-interest in our spoons, we put a plain hook/minnow rig under a bobber in a hole close to the hole we were jigging in. The presentations were maybe 3 feet apart. We would get the walleye’s attention with our jigging spoon. We would see the fish come in and look at the spoon, then go away. Just a few seconds later, the bobber would go down, and after a few more seconds the hook was sent and a walleye would come through the hole. We caught a good number of 14-17 inch walleyes employing this tactic. However, the biggest walleye, a fat 25-incher, couldn’t resist the fluttering action of a Northland Buck-Shot Flutter Spoon. We also had our Otter portable shelters with us. When action slows in the hard-shelter, we can get out and “troll”. The portable shelters enable us to cover large areas in search of fish, and the Thermal-Tec lining of the shelter enabled us to stay very warm inside this portable shelter. Even when conditions are cold, these Otter’s keep us warm and fishing. Last thing: Dress appropriately. Guidewear bibs allow us to kneel on the ice when landing a fish and still keep dry. Guidewear has become such an important part of an ice-anglers arsenal: I think some anglers would rather leave their cell phone home than their Guidewear! It really is that good. We have lots of ice-fishing season left. Cold weather is no reason not to participate. Prepare for the cold and you’ll enjoy your ice-fishing even more.